Objective The objective of this study was to develop a simple non-invasive risk score, specific to the United Arab Emirates (UAE) citizens, to identify individuals at increased risk of having undiagnosed type 2 diabetes mellitus. Research design and methods A retrospective analysis of the UAE National Diabetes and Lifestyle data was conducted. The data included demographic and anthropometric measurements, and fasting blood glucose. Univariate analyses were used to identify the risk factors for diabetes. The risk score was developed for UAE citizens using a stepwise forward regression model. Results A total of 872 UAE citizens were studied. The overall prevalence of diabetes in the UAE adult citizens in the Northern Emirates was 25.1%. The significant risk factors identified for diabetes were age (≥35 years), a family history of diabetes mellitus, hypertension, body mass index ≥30.0 and waist-to-hip ratio ≥0.90 for males and ≥0.85 for females. The performance of the model was moderate in terms of sensitivity (75.4%, 95% CI 68.3 to 81.7) and specificity (70%, 95% CI 65.8 to 73.9). The area under the receiver-operator characteristic curve was 0.82 (95% CI 0.78 to 0.86). Conclusions A simple, non-invasive risk score model was developed to help to identify those at high risk of having diabetes among UAE citizens. This score could contribute to the efficient and less expensive earlier detection of diabetes in this high-risk population. The United Arab Emirates (UAE) has one of the world’s highest prevalence rates of type 2 diabetes mellitus (T2D). Risk scores to identity individuals at high risk of T2D have been developed for other nations. This study provides a risk score specific and appropriate to UAE citizens. Early detection of T2D in UAE citizens might allow an early intervention and reduces its complications. In this context, several researchers have already developed risk assessment tools for other nations based on simple routinely collected information and anthropometric measures to predict the risk of having undetected diabetes before sending individuals for blood tests.9–13 However, these risk tools may not be useful or appropriate to the UAE population due to differences in lifestyle and ethnicity. The aim of this study was to develop a simple, non-invasive, self-administered and informative risk score system appropriate for UAE citizens to identify individuals at high risk of having undiagnosed diabetes. The study accessed data from the UAE National Diabetes and Lifestyle Study. The UAE National Diabetes and Lifestyle Study is a cross-sectional survey designed to investigate the prevalence of diabetes and associated risk factors among UAE citizens and expatriates. The data were collected in two phases. In the first phase, non-UAE citizen adults (including our validation sample of Arab non-UAE citizens) who had lived in the UAE for at least 4 years were surveyed. In the second phase, data were collected from UAE citizens. The survey was conducted during 2013 in Sharjah and the Northern Emirates. We used the data collected in the second phase of the UAE National Diabetes and Lifestyle Study, which include only UAE citizens, aged 18 years and above. People with previously diagnosed diabetes, serious physical disabilities, learning disorders, severe communication barriers and pregnant women were excluded from the analysis. The variables considered included demographic (eg, gender, age, geographic location), family history of diabetes and lifestyle habits. Anthropometric measurements (weight, height and waist and hip circumferences), and systolic and diastolic blood pressure were obtained. In addition, a fasting blood samples were assayed for blood glucose and glycated hemoglobin (HbA1c). Diabetes status was based on an HbA1c test. Cut-off values for the test were defined according to the WHO criteria, whereby <6.5% was considered non-diabetic and ≥6.5% indicated diabetes.15 16 A family history of diabetes was defined as a parent or a sibling with diabetes. Body mass index (BMI) was calculated by dividing a participant’s weight in kilograms by his/her squared height in meters and placing participants into three categories (<25, 25–29.9 and ≥30 kg/m2). The waist-to-hip ratio was calculated as the waist circumference divided by the hip circumference. A waist-to-hip ratio <0.90 for males and <0.85 for females was considered normal. Hypertension was defined as a self-report diagnosis and/or blood pressure ≥140/90 mm Hg. To describe the demographic and clinical characteristics of the population, we reported frequencies with proportions for people with diabetes and people without diabetes. Univariate analyses were conducted to identify the significant risk factors. The non-significant variables were eliminated. Statistical significance was set at P<0.05. Stepwise forward logistic regression modeling was used to develop the score, with diabetes status (yes/no) as the dependent variable. The Omnibus Tests of Model Coefficients showed that the multivariate logistic regression models were statistically significant. The casewise plots were not produced because no outliers were found and no multicollinearity detected (variance inflation factor <3). For each significant variable in the multiple logistic regression analysis, a score was calculated by multiplying the regression coefficients by 10 and rounding to the nearest integer. The risk score for an individual patient was determined by adding the score for each variable in the risk model. A receiver-operating characteristic (ROC) curve and the area under the curve (AUC) were used to evaluate the risk score developed and to determine a cut-off for our population based on maximizing a sum of sensitivity and specificity. Data from Arab non-UAE citizens living in the UAE (phase I) were used to assess the validity of the UAE citizens’ risk score (n=631). The data analysis was performed with the Statistical Package for Social Sciences (SPSS) V.22 (IBM, New York, USA). Reporting followed the Strengthening the Reporting of Observational Studies in Epidemiology statement for cross-sectional studies. Of the 872 participants in the study, 449 (51.5%) were male, and the mean was age 42.8 (SD 13.4) years. The crude prevalence of total diabetes in the Emirati adult population in the Northern Emirates was 25.1%. The prevalence of undiagnosed diabetes was 14.8%. Table 1 describes the sociodemographic, medical history and anthropometric characteristics of the study participants. The risk factors for undetected diabetes were evaluated using univariate regression analysis (table 2). Gender, income, education and smoking status were not statistically significantly associated with the presence of diabetes (P>0.05), and were, therefore, excluded from our final model (table 2). The variables included in the final logistic regression model were age (<35 vs ≥35 years) (OR 3.38, 95% CI 2.23 to 5.12), a family history of diabetes (OR 2.08, 95% CI 1.47 to 2.96), BMI (kg/m2) (OR 1.97, 95% CI 1.17 to 3.30) and hypertension (OR 1.48, 95% CI 1.04 to 2.18), after stepwise forward modeling (P>0.05) (table 3). The risk score for each variable in the model was calculated by multiplying the β-coefficient by 10 and to the nearest integer(table 3). The performance of our model is shown in figure 1, with an AUC of 0.82, 95% CI 0.78 to 0.86. The model revealed a moderate sensitivity of 75.4%, 95% CI 68.3 to 81.7 and specificity 70%, 95% CI 65.8 to 73.9, with an optimum cut-off ≥19 points to identify risk of having diabetes (table 4). 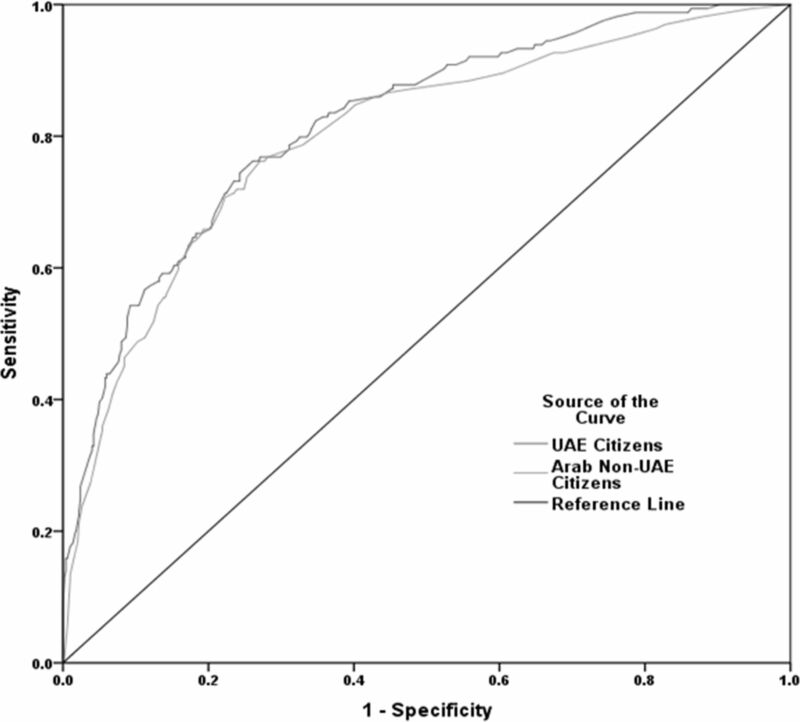 Receiver-operating characteristic curves showing the performance of the diabetes risk score in predicting diabetes in the United Arab Emirates (UAE) citizens (area under the curve (AUC)=0.82, 95% CI 0.78 to 0.86) and Arab non-UAE citizens (AUC= 0.80, 95% CI 0.76 to 0.84). We assessed the validity of this risk score on data collected from the non-citizen Arabs in first phase of the UAE National Diabetes and Lifestyle Study. We have chosen the data for the Arab population residing in the UAE because of their similarities with UAE citizens. Of the 631 Arab non-UAE citizens (validation sample), 455 (72%) were male, with a mean age of 38 (SD 11) years. The risk score model performed very similarly in the validation sample with a minimal decrease in the AUC value (0.80)and sensitivity (74.4%) and a minimal increase in the specificity (71.5%) (table 4). The cut-point, based on maximizing the sum of sensitivity and specificity, for diabetes was higher for the UAE citizens (≥19) than for Arab non-UAE citizens (≥15). We developed a scoring system to predict the presence of undiagnosed diabetes among adult UAE citizens. The risk factors identified from the univariate analysis were similar to those reported in earlier studies, and include self-reported demographic and behavioral factors, medical history and anthropometric measures.9–13 The model included risk factors that could be obtained by self-report or measured by a health professional without the need for a blood sample. The significant risk factors identified in our model are age (≥35 years), a family history of diabetes (parents or siblings), blood pressure status, a BMI ≥30 and waist-to-hip ratio ≥0.90 for males and ≥0.85 for females. Our scores showed moderate sensitivity and specificity in detecting undiagnosed diabetes. Therefore, this non-invasive model could be used to identify individuals at high risk of developing diabetes within the Emirati population. It provides a safe, inexpensive and easy self-administered tool for screening. This study developed a risk score model that is specifically designed and appropriate for UAE citizens to assess diabetes risk. It offers a non-invasive, inexpensive and safe tool for screening to identify Emiratis at high risk of having undiagnosed diabetes. World Health Organization. Global report on diabetes. Geneva: World Health Organization, 2016.
. Screening for diabetes in Kuwait and evaluation of risk scores. http://apps.who.int/iris/bitstream/10665/117964/1/16_7_2010_0725_0731.pdf (accessed 30 Dec 2016).
. AUSDRISK: an australian type 2 diabetes risk assessment tool based on demographic, lifestyle and simple anthropometric measures. Med J Aust 2010;192:197–202. World Health Organization. Definition, diagnosis and classification of diabetes mellitus and its complications: report of a who consultation. part 1: diagnosis and classification of diabetes mellitus. Geneva: World Health Organization, 1999. World Health Organization. Use of glycated hemoglobin (HbA1c) in the diagnosis of diabetes mellitus abbreviated report of a WHO consultation. Geneva: World Health Organization, 2011.
. Diabetes mellitus in Saudi Arabia. Saudi Med J 2004;25:1603–10. Contributors NS, JS, PZ, SA, AH and SE planned and designed this study. IM performed data management and data analysis and all authors interpreted the data. All authors drafted the manuscript and approved the final version of the manuscript. PZ and JS revised the paper critically for important intellectual content. Funding This work was supported by Ministry of Health and Prevention, University of Sharjah and Sanofi (grant number 120301). Ethics approval University of Sharjah and the Ministry of Health Research Ethics Committee. Data sharing statement Data from the UAE National Diabetes and Lifestyle Study can be obtained by writing a proposal to Professor Nabil Sulaiman.